Steel track groups 230mm wide 90mm pitch : SARL Maxima, Specialists in the sale and reparation of machines and accessories for the construction industry. Importer and distributor of both hydraulic and pneumatic equipment. 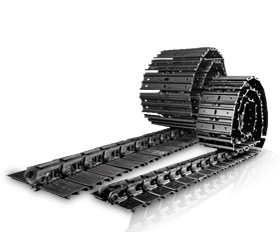 We hava a large range of steel track groups, ready to mount directly on your machine of a width of 230mm and a pitch of 90mm. Tracks with either welded or bolt on pads depending upon the type of your machine.